The lines between online and offline shopping will continue to disappear as we move closer to 2020. There will be many transformations: tagging things you like on the street, on shows you watch and items in ads you see. This will streamline much of how we shop; getting shoppers to physical stores that carry things they like, telling stores more about what their target consumers want, and allowing each shopper to emerge in virtual shopping experiences. Join the transformation in how we shop by 2020, and bring your own thoughts and links to the table at the end. Online privacy concerns have taken a backseat where services, social community and convenience is provided. As we jump into shopping in 2020, there are a few big themes impacting life and shopping that need to be kept in mind. A few of these worldwide trends are highlighted here, but each has a mountain of implications for the way we live and how our cultures evolve. Technology continues to evolve, but is more focused than ever on fixing social issues, improving health, energy, food and water shortages. Credit cards, loyalty cards, insurance cards and everything else will be enabled in your mobile device. While cash is still king, your wallet will appreciate a slimmer, plastic-free profile. This will also bring many benefits to life like automatic checkout, as you walk out, making cashiers less necessary in many categories. This means no more checkout lines and more service personnel to make your shopping experience a pleasure. This is already happening in Japan and other counties outside the US. In the US, Visa has announced pilots in New York and California for city transportation, but it will likely move quickly into the mainstream over the next 5 years. For Kroger, Tesco, Carrefour and other grocery retailers, this will mean making sure things are never out of stock, helping customers find things and introducing them to new foods and recipes. At The Home Depot, Lowe’s, Kingfisher and other home improvement stores, you are likely to find more experts and other added services such as sustainability consultants, interior design advisers and organization consultants. Metro Group, Macy’s Group, Indetex, Belle International and other retailers will deliver a mix that includes continued focus on service, access to personal shoppers and wardrobe stylists, along with ways to keep costs under control. The current “get local” trend moves well beyond food, and continues to impact big box malls and shopping centers. Around the world today, while many big box stores and large shopping malls are still being built, many more are falling empty and dying. This is finally starting to cause a pause among developers, but a total rethink by 2020 will have happened and many properties will open over the next ten years that will bring shopping closer to home. The corner store clusters or main street mixed use districts that promote walking and socializing will draw from our past to rethink the architecture, public spaces, gardening, density and mixed use of land development by 2020. While different mixes of big box and local shopping exist–especially in Europe, Latin America and Asia–this “ah ha” moment will continue to impact how developers around the world create a more balanced and sustainable mix of shopping across the megacities. Transforming big box stores and dated malls will be big business leading up to 2020, and it has the potential to resurrect neighborhoods and improve quality of life in suburbs or parts of cities that may seem like they are in decline today. Mom and pop stores and niche boutiques find resurgence by 2016 in countries like the US where they have been on the decline. Take a look at this TEDx Atlanta video presentation by Ellen Dunham-Jones (duration 20 minutes) about urbanizing suburbia and recapturing under performing spaces. She delivers some compelling data that supports this transformation. As new technologies and offerings collide on a little “phone” that’s already smarter than most people’s first few computers, you can be sure it will continue to transform the way we shop and share the experience. By 2020, most consumers won’t even recognize mobile devices compared to the smart phone in your hand today. More displays will be placed around shops and in public places, allowing you to experience more than what will fit in your pocket or purse, and allowing retailers (or other advertisers) to use savvy ads and suggestive prompts to entice you with an offer or introduce you to something new. You may find yourself wearing glasses again, even with 20/20 vision. Display and visual information capture will be enabled through things like glasses, or eventually contacts, embedded with head’s up display technology, video, tag and other scanning features to capture what you see and show you the information you want versus what advertisers want you to know. I’ve got an app for that… App integration will happen (may it be a more elegant evolution than forefathers like the Microsoft Office Suite) and a Shopping Suite emerges to enable this experience like never before. Voice-driven, context-aware devices enable discrete tagging of merchandise for immediate comparison or to add to a list. Virtual social shopping takes new meaning as your friends follow you digitally through your real world shopping trip, sharing advice and recommendations virtually. Hide Me or Invisibility becomes an important mobile app, allowing you to cloak your activities when you are not in shopping mode and need a more passive environment. Samsung and Nokia both have future concept videos in this space. Samsung’s video below (duration 1.50 minutes) presents a vision of how this could evolve. Being a global citizen takes on new meaning with real-time and in-ear translations, this removes any language barrier and making shopping ubiquitous. Whether you are taking an evening stroll in your own city or traveling in Rome, Paris, Tokyo or Shanghai, transactions will be easy no matter what language you read, write or speak. As you move through your day, it will be easier to tag items you like and buy them immediately or add them to your shopping list. For example, a purse or pair of shoes on a passerby catches your eye. You say “tag item” as you look at the item and immediately receive confirmation that the item has been identified. Buy it now or add it to a list for later. Being able to tag items you like will also allow you to find physical stores that carry similar treasures. Finding new stores that you are going to like will be easier than ever. You will be able to see the stores your friends visit and get recommendations based on the types of products you’ve tagged along with preferences to shop on other ratings like sustainability, fair trade and the like. One current example, is shown in this two minute video of a shopping wayfinding phone app. Things will get more advanced, more intuitive and the user interface will improve, but this technology is already starting to emerge. An example from today’s tech is in the start-up Nuji who wants to start tagging products online. It could be the start of something big if run smart today with a clear vision for the future. X-box and PlayStation are no longer kid’s play; the gaming toolbox has evolved to become your virtual immersion device used for gaming, deep conversations, and business, especially shopping. Companies like 3D Internet will work with retailers to allow shoppers to immerse into a world rich in sound and vision, but also allowing some feedback through other senses like touch and smell. Shopping and exploring in this virtual reality is a dream for those who have a hard time finding what they want. Instead of just browsing shop after shop not knowing if you will find what you want, your virtual shopping experience will be filled with items you’ve tagged, related suggestions and complimentary colors and styles. Do they have my size? Yes. They are all your size. 70% of clothes will be made to fit your custom size. Imagine walking through a store and every department was stocked with items you liked and always had your size. Get a clunky taste of virtual shopping from home in this 50 second video. In the future, the big difference is that the store will know your measurements and automatically adjust. The next two videos (duration almost 3 and 2 minutes respectively) give you a sense of just how different virtual reality, or augmented reality, could become around 2020 – 2025. While they don’t directly cover shopping, both videos give you a glimpse into a very different way to think about the next digital revolution. The second video, in particular, could be something that kids growing up totally digital might start to embrace. Though the technology and digital content needed may only be in early stages by 2020, it offers a “life as game” kind of appeal to virtual/augmented reality. More and more emphasis will be placed on first impressions: the moment you enter a shop. It is the moment the retailer has to capture your attention and draw you in. Stores not on the top of your list will have to compete in new ways to gain your attention, and the stores that are on your frequent shopper list will want to retain that place with a passion. Based on what you share with a store (via mobile device, tagged clothes you have on, etc. ), the shop will be able to further tailor offers for you, highlight products related to your tags, or intrigue you with ads that trigger your curiosity. Today, there are pioneering start-ups like Bizzy who have suggestion engines and special offers. But, imagine the millions spent today on advertising for TV and online, also moving into the front of stores in new and engaging ways. Paper and plastic point of sale (POS) signage become quaint and infrequent as digital displays become ubiquitous, covering everything in a thin layer of possibilities. Some shops will use traditional paper as a differentiator, but most will focus on finding even better ways to use cost effective digital displays. This trend is already being talked about and experimented with under the term “clean store” initiatives by Wal-Mart, Target and other big retailers. But, the larger opportunity is to rethink these touchpoints and not treat them as their old POS predecessors. 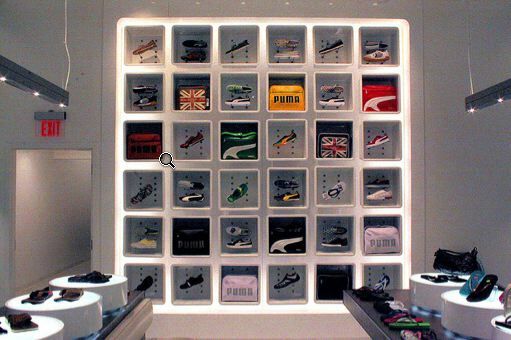 Instead of printing a display every month, your feature wall could be a high definition image that changes with the time of day or with the real time make up / insights related to shoppers near your store. Need eyeballs so people notice your store and want to walk in? You could do slow motion video snippets that pique curiosity and feature anything you carry related to a tagged item of window shoppers. Though displays will be a huge change in the makeup of the shopping experience, other technologies will also play an interesting and evolving role. Imagine getting a whisper that no one else can hear about a new fragrance or some other offer as you enter a shopping area. The use of sound to whisper custom messages, ads and offers, while available today, will be perfected and used more broadly around 2014. Expect to see other technologies that touch your senses including scents, projections, holograms and the like get even bigger around 2016. Take a look at Microsoft’s future vision video below (duration 2 minutes). While many of the concepts will be able to be produced by 2020, there are some that will most likely not be mainstream until closer to 2025 or 2030. That said, it does start to paint a vision of what could be. Items we buy will have an electronic thread IDs woven into them, making it easier for others to tag them for future purchase. Some brands will differentiate by allowing you to remove these product/brand tags. Others will help you use the tags to get loyalty rewards for wearing them around town. The best advertisement is a happy consumer using or wearing your product. You will be able to either hold your mobile device up towards an item or select it through your eyewear–even an orange at a grocery store–and learn things about it like where it is from or when it was picked. Stores will be self aware due, in part, to these tags and will be able to know when an item needs to be restocked, is out of place, or what aisle and digital shelf strip needs the price change applied to it. To enable the future and capture their market share, stores will need to be more tech savvy than ever or will need to work with outside services that fill this gap. The richness of data, if visualized well, will give even small shops unprecedented ability to fine tune their offering to target their core audience. This goldmine of data will be there, but visualizing it will be paramount in order to act upon it. Retailers will also need their items tagged and programmed to show up in the virtual shopping network along with any digital merchandising that might add to revenue and make even happier customers. From restocking to enabling consumers to find everything on their list, the store of the future needs to be planned for today to enable the technology touchpoints involved in consumer-facing and behind-the-scenes parts of transforming retail. This shopping video by Microsoft (duration 2.5 minutes) touches on a few of the concepts that will start to transform the in-store shopping experience around 2020 including the use of tags and displays. Things like dynamic shopping lists, store feedback on what aisles you need to hit, restocking notifications, and digital shelf strips that can highlight the item on your list as you approach, are all achievable by 2020 and will likely not be confined to your mobile device as shown in the video. Instead of just mass retail, digital will continue to benefit unique smaller entrepreneurs as individuality and durable quality goods are increasingly valued. Store windows will also be 24/7 windows into shopping for featured merchandise. This 2 minute video shows some current technology that is being developed for future interactions. Retailers and brands will have the ability to identify and manage brand conversations happening in real time across a vast number of touchpoints. Those who are best able to understand and connect with their customers will increase sales, reduce product returns, improve customer loyalty and reapply learning from customers to drive improved products and product offerings. With all the data and advertising, new businesses will be formed to better consolidate and visualize information for consumers as well as businesses. The shopper will be able to use head’s up displays to pull up a data dashboard and evaluate different products from the #1 combo meal, food and health to 3D displays, electronics and transportation. Visuals combined with whisper technology will allow you to see or hear any alternate options on an item of interest. Imagine finding the perfect pair of pants and being able to quickly view alternate styles available from colors, fabrics, sizes and the like. Scheduled delivery (weekly or bi-weekly), finally gains a significant foothold worldwide. With more people than ever in cities, the critical mass, along with the business model, will allow for sound delivery services. In some areas this will still be delivery of staple food items (cereal, rice, soda, milk, etc. ), but overall it will mean saving time and allowing shoppers to focus on other things. While this is already available in some cities and via some retailers, the opportunity by 2020 is to transform this space so it doesn’t matter which retailers you are ordering from. The consumer get’s one regular delivery from a trusted source that can pick up and deliver items from Walgreen’s, Target and Whole Foods. Some will choose to spend time they would be shopping by self-selecting fresh produce in-person and others will spend it tending their organic gardens or in other social interactions. For brands and retailers, this means once you make it onto a scheduled delivery routine your retention rate will likely remain high. The trick will be getting your competitors off the list and yourself on it. For delivery companies, these home delivery specialists may become the preferred route for the last few miles of the FedEx and UPS supply chains. They may also differentiate by getting to know their regular customers and forging relationships within the community, bringing back the human element that has gone missing from this service industry. The rise of reuse will continue into the next century as the focus on sustainability and responsible consumption continues. People will increasingly consider the lifetime value of purchases and avoid items that can’t easily be passed on or aren’t durable enough to last a long time. Everyone knows that second hand saves money, but this shopping trend will move well beyond the wallet and the 60 million in the US that actively shop this space. The key secondhand categories will be clothing, jewelry, books, furniture, kitchenware, musical instruments and appliances. Businesses focusing on second hand merchandise will be increasingly busy whether that is an ebay, Amazon.com, the local thrift store, yard sale or newcomers targeting shoppers in this space. Companies like CarMax already have years of experience focusing on the secondhand market for vehicles and may offer some tips to start-ups in other categories.